Pizza Hut Flavor Your Life ~ Philippine Freebies, Promos, Contests and MORE! Pizza Hut has prepared a new palatable pizza with thinner crust and bursting flavor . The new Tuscani pizza offers five (5) tastes plus a contest with great deal of prizes. 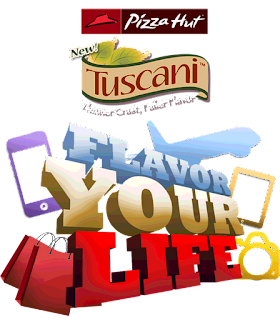 Join the Flavor Your Life contest simply by choosing your favorite Tuscani pizza flavor along with its equivalent prize. Make a creative 500-word blog post about why you chose that flavor and how winning its corresponding prize will add flavor to your life. You can make multiple entries for every category for a greater chance of winning iPad 2, iPad 4, DSLR camera, trip for two to Boracay, and P20,000 worth of GCs from Araneta Center.